My WordPress Notifications informed me that today is this blog’s third anniversary. As a blog that has evolved over time and become what I did not imagine even in my wildest dreams would become, it is time for some celebration indeed. Hence, I decided to do it with something sweet, Rava Laddu. You might have seen a Boondi Laddu, even a Motichur Laddu but not even in your wildest dreams would you have come across the Rava (Semolina) Laddu… unless you are India, of course. No, your local Indian restaurant or store is not going to carry this delicate sweet. You have got to go online and find the recipe. Since it is a specialty in the city of Madurai in Tamil Nadu, which happens to be my mom-in-law’s hometown, I did not have to go looking for the recipe anywhere. After rummaging through my pantry a month ago, she came across a packet of pre-made Laddu mix (that she had made the year before when we visited home) and was slightly horrified bordering on miffed to know that I hadn’t made it yet. So praying to all the deities that it shouldn’t have gone bad, she ventured into making delicious Laddus for snack one day. 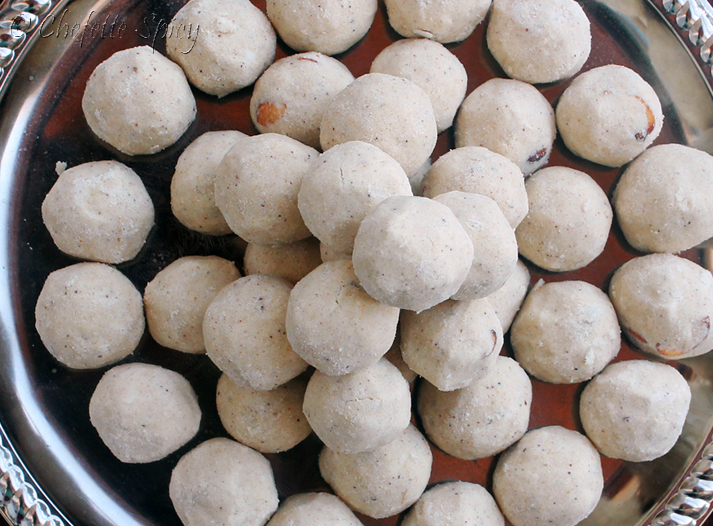 The Rava Laddu, what can I say about these beauties? Semolina is gently fried until slightly brown and then sugar is added along with cardamom powder. This is sauteed again on gentle heat until golden brown and aromatic. Fried nuts are mixed into this powder, along with a generous amount of Ghee (brown butter) and this mixture is gently molded into small spheres by loving hands. The result is a very decadent sweet that is extensively made during Deepavali in India. But Amma made it as a snack at home. Can you blame me for making a dinner out if Rava Laddus? Categories: amma, Chennai, Food, Indian, Indian Sweet, Recreated | Tags: amma, dessert, dinner, ghee, laddu, madurai, nuts, pantry, rava, snack, sugar, sweet | Permalink. Halwa is the most diverse of all sweet treats/desserts in the world. From the Middle East to South Asia, Halwa finds its rightful place in a whole repertoire of cuisines. Halwa (or halva or sometimes Alva as we call it in the Indian down South) is typically made out of flour, sugar, butter and dry fruits and nuts which are added in the end to the dish. My most favorite kind will forever be the wheat Alva we get in Tirunalveli, a city in Tamil Nadu. Oh my gosh, the taste. I seriously cannot do justice to this wonderful dish on a single blog post that is not about Tirunalveli Alva. Let me just say this: if I had to choose one dessert and I was allowed to eat only that all my life, I would choose this sweet. And I won’t regret it. A couple of days ago, we decided to take advantage of the fresh carrots at home and make carrot Halwa. This is one of the easiest sweets I’ve ever made and it is also one of the yummiest. The condensed milk gave it a wonderful depth to the halva. So it really is a win-win situation. My only regret was that we made very little. I cannot wait to make more and eat it hot out of the pan, a kick in Winter’s cold a**. Cook the carrot and condensed milk along with cardamom powder on medium hear. It is done when the carrot becomes completely soft and all the water from the milk and carrot condenses. Melt the Ghee, add the slivered almonds and raisins. Let them brown. When done, mix them into the Halwa along with the salted cashews. Carrot Halwa tastes the best when eaten hot off the pan with vanilla ice cream. So good! Categories: Cakes and Desserts, Dessert, Dessert, East, Food, Indian, Indian, North, Recipe, South | Tags: almonds, alva, cardamom, carrot, cashew, condensed milk, dessert, halva, halwa, Indian, raisins, sweet, tirunalveli, winter | Permalink. 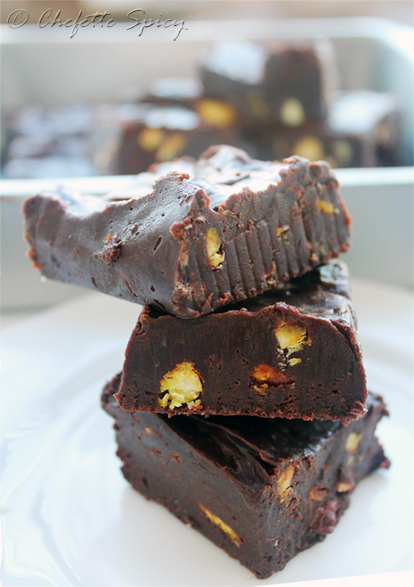 When it comes to picking a chocolate recipe to make, it is a no brainer at this household. I always pick Ina’s Outrageous Brownies and I am never disappointed. So this time, I surprised myself by craving something chocolate that was not brownies. I wanted fudge. And I didn’t want to switch my oven on. I probably get zero points for creativity but hey, I was not competing in a contest! 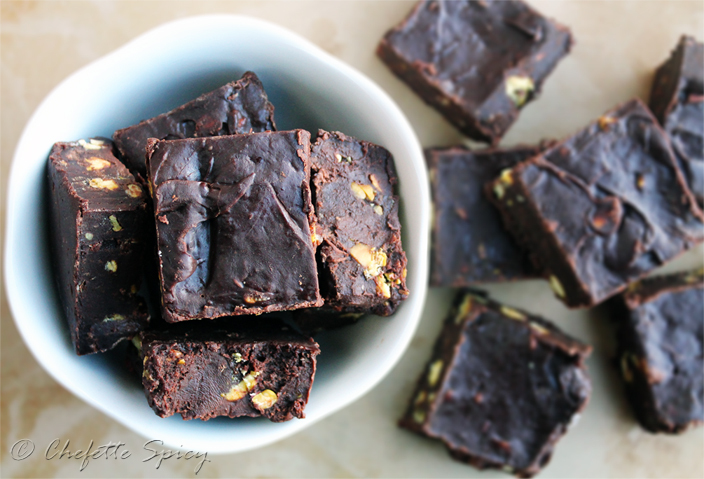 Shopping around for recipes, I came across Nigella’s Chocolate Fudge with Pistachio recipe and decided to be daring. When I say daring, I use the word loosely because this is the first Lawson recipe have ever made and am I glad I tried it! These chocolate-y squares are pure heaven and the taste is only magnified by the sweetened condensed milk. Although I do wish I had added a dash of vanilla to the fudge, I didn’t miss it as much as I thought I would have, thanks to the pistachios. Oh, the pistachios! I have a truck-load of salted-roasted pistachios sitting in the refrigerator and this recipe was an amazing way use up some of them. Since my nuts were already salted, I did not add the pinch of salt Nigella’s recipe lists. Categories: Cakes and Desserts, Chocolate, Dessert, Food, Pastry | Tags: brownie, chocolate, dessert, fudge, jan, nigella, no-bake, pistachio | Permalink. Phew, I am so tired! This is the birthday weekend- I had mine on Thursday, Aarabhi turned three months today and the hub has his coming up tomorrow. I’ve been trying to get lots of things done this weekend and ultimately ended up doing nothing. Oh I did edit a few pictures, click new ones and made a birthday cake for Kishore (shhh!). I have four huge projects/case studies to complete in Financial Accounting and a paper I should be working on for Information Systems. Yet, I sit here all careless and free and write about the wonderful Kesari Amma made for my birthday. Daredevil much? 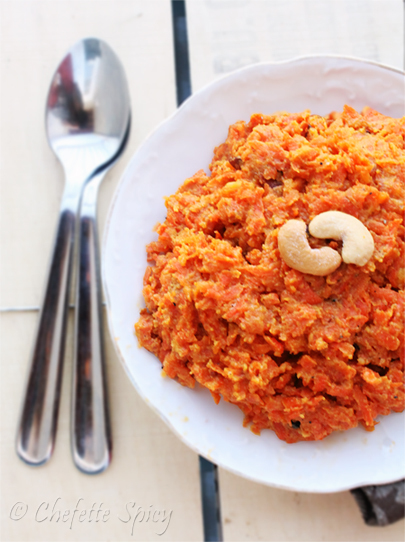 Kesari is a kind of pudding made with Rava, a by-product of wheat. It has a coarse, cornmeal like texture and a nutty flavor. I once replaced it for couscous in a salad I made and called it semolina salad. 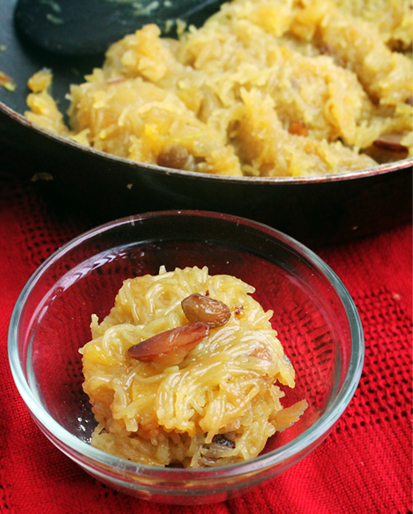 Kesari is also made with Semiya or Vermicelli, a kind of noodles we use quite a bit in Indian cooking. My mother, well aware of the fact that I am mentally-allergic to Rava Kesari (thanks to a gluttonous incident that happened more than ten years ago), made Kesari with Semiya last month. I fell in love with it and nearly replicated the afore mentioned incident (some people never learn!) but good sense stopped me on time. Well, that and a husband who fell equally in love with the dish. So when Amma asked me what sweet I wanted for my birthday (making sweets for birthdays is a tradition quite common in India), it was only natural that I pounced on another opportunity to eat the wonderful Semiya Kesari. This time, she stepped it up a notch by adding pineapple to it. Before you make unappetizing noises, let me tell you this. It was wonderful!!! So wonderful that I am already making plans to go eat the leftover Kesari after I write up this blog entry. Heat the clarified butter on medium heat in a pan. Slightly toast the Semiya. Add the milk and the water when it releases a nutty fragrance. When it starts boiling, add the sugar, powdered cardamom and pineapple and mix. Turn the heat to medium-low and cover the pan. Let it cook, absorb the water and melt the sugar. When the Kesari turns semi-solid, turn the heat off. In a separate pan, add the one tsp of butter and fry the almonds and raisins until brown. Mix it with the Kesari. Eat with vanilla ice cream to attain dessert Nirvana. Categories: Aarabhi, amma, Cakes and Desserts, Dessert, Food, From Amma's Trove, Indian, Indian Sweet, Recipe, South | Tags: Aarabhi, amma, birthday, dessert, ice cream, kesari, kishore, nirvana, pineapple, semiya, sweet, vermicelli, yum | Permalink.